We were delighted to get this update from longtime TWAICB colleague Pedro Mena about his art education work at Columbus Academy in Columbus, Ohio. 8th grade students at Columbus Academy created album cover art based on the UDHR. In 8th grade Art at Columbus Academy this year, students are choosing an article from the Universal Declaration of Human Rights and creating a print based on its statement. 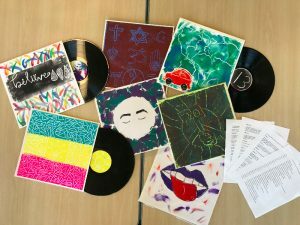 The Human Rights on Record project uses printmaking on an album cover format to illustrate and interpret the 30 articles adopted by the United Nations General Assembly in 1948. Eleanor Roosevelt chaired the committee to help write these articles which helped to affirm an individual’s rights. Thank you Eleanor! “Everyone has to the right freely to participate in the cultural life of the community…and to enjoy the arts.” (from Article 27). This is a sampling, and there’s more to come, as we will be doing this all school year with each of our 95 8th graders.